The quest for burgers that were worth a darn took us to Barney's Gourmet Burgers in Brentwood/Santa Monica where we were obliged to choke down a "gourmet" burger so that you don't have to. 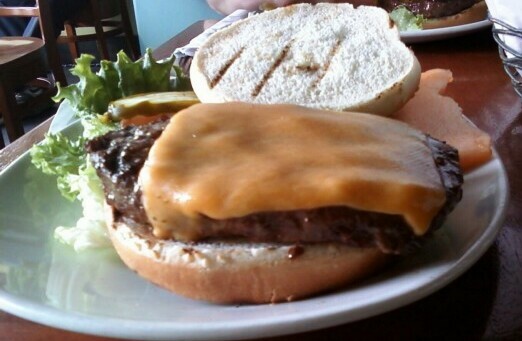 To call this cheeseburger "gourmet" was sort of like calling OJ "innocent." 1. Both the curly fries and the steak fries were pretty damned good. 2. The beef was cooked (grilled) flawlessly to a perfectly juicy Med Rare. 3. The grind was nice and coarse and the patty was loosely packed. 1. The bun was dry, dry, dry--it overwhelmed the burger with dryness. Also, it was dry. 2. 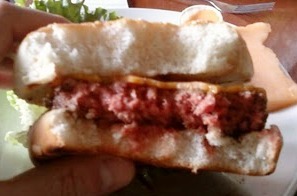 The burger meat, while juicy and properly cooked, lacked any real flavor or character. The only thing that we really tasted was the char, and that was not interesting enough to sustain the dish. 3. The cheeseburger was vastly under-seasoned. Salt and freaking pepper--how hard would that have been? 4. It was an oily mess--the Cheddar and the beef both oozed oil without the impact of any added flavor or creaminess. We found ourselves repeatedly wiping our mouths to get the grease off of our lips. 5. The walls of the restaurant were littered with "Best of..." awards from the past decade--all of these awards were from the Bay Area and not LA--they apparently do not know Jack and/or Shite about burgers in the Bay Area if this greasy disappointment was the best thing that ever happened. This burger was like the really hot girl that just lays there--it looked great, and it did not deliver. It was a one-note dish, and that note wore thin within two bites. Burger Review : This burger was pretty freakin' far from OK. If you're looking for a good version of this burger, just go to The Counter. Note...after re-review, The Counter was also awful.